Now that Core 2 and rotation has been announced, I thought I’d do a series of articles aimed at early level deck construction. One of the things I hear most from new players is “Is there some sort of resource I can read/watch to understand this game better,” and I think one of the better ways to understand the game is through good deck construction. There’s a lot it doesn’t teach (good action economy, when clicking for credits and/or cards is good, etc) but it helps you learn to see what enough economy looks like, the importance of efficient breakers, etc. Basically, it helps them learn to make good choices before the game even begins. If this sounds like the exact opening paragraph of my last article, that’s because it is! But moreover, if these sound like things you would like to know and work on, then welcome! Let’s get into it. In the last article I talked about choosing your identity card, and the importance of it. This time I want to focus on what I believe is the most important part of almost any deck’s construction. This time I want to talk about credit economy. Often, when newer players make their first deck, they will throw in lots of breakers, tons of tricks, some cool thing they saw, and a neat idea they had. Their corp decks will be full of traps and huge, damaging ICE with the dreams of flatlining the runner with ICE, or making such large servers the runner will never be able to get in. Then, as an afterthought, a handful of economy cards are added. I watch these games play out, and they either end up with the player drawing like crazy for the bare-bones economy they have, discarding most cards drawn, or sitting around clicking for credits and never having money for more than a couple runs or ICE rezzes per game. In fact, the economy of your deck is one of the first things you need to think about, since you can’t really play a game of Netrunner without it. 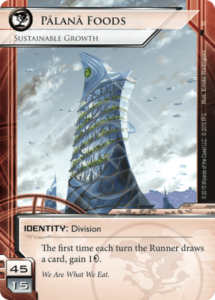 At it’s heart, Netrunner is a war not between a corp and a runner, but between two credit pools. This isn’t necessarily to say that the person with the larger credit pool is going to be the person to win every game, but if one person has a larger credit pool more consistently over the course of the game, they can often use it to leverage themselves into a win. Having money gives you options to use your cards instead of having to spend turns simply clicking for credits, effectively passing your turn because you didn’t give yourself enough credits within your deck to have any other options. Clicking for a few credits here and there isn’t bad to do, mind you, but if that’s all you do then you’re probably not winning this game. Within the game, there’s 3 types of economy cards: burst economy cards that give their credits in one shot and are then expended, temporary economy cards that stick around on the board and give you some amount of credits over time before depleting themselves, and sustained economy cards that stick around the entire game, giving you money. The most obvious of the first type are cards like Sure Gamble and Hedge Fund. They’re effectively the same card (one for corp and one for the runner), giving you a net of 4 credits before resolving to the trash. Cards of the second type are cards like Armitage Codebusting or Adonis Campaign, which you place X many credits on, and then remove gradually. Adonis gives you the credits when your turn begins, so starts with a clock on when it will finish, but Armitage requires the runner to spend time using it in order to gain credits; regardless, they both are limited in their gain. Finally, cards like Magnum Opus and Pad Campaign stick around forever, and are able to give you money all game long (unless trashed by your opponent). Due to the nature of the game, it’s probably best if I split up the econ talk by sides, rather than talking about them both at once. Because of the asymmetrical play style, each side has to think about how they want to install and play each card as well as the potential risks in doing so, so it would become a jumble trying to fit it all in the same space. I’ll start with the Runner. As far as the game’s goals go, it’s the Runner’s job to be able to install stuff, and (usually) use that stuff to access the corp’s agendas to win the game. You can also use that stuff to make the corp deck themselves and win that way, but that’s less common in standard Netrunner. Regardless of your win condition, you need to install stuff and use it. Generally, to access agendas to win the game, you need to make runs on the corp’s servers, and to do that, you need to have Icebreakers to match the strength of their ICE, and to break the subroutines on that ICE. It also helps if you are able to access more than one card at a time, in order to improve the chances that you’ll hit an agenda on a given run. There’s also tricks you can use, like Inside Job, to skip past ICE and go straight to the access part that are also good to include. You can’t do any of this without money. Heck, in Netrunner, you can’t even make money without money; not without clicking for credits. Sure Gamble, the most standard, vanilla econ card in the game, costs 5 credits. 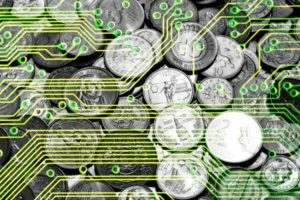 So how much money do you need in a game of Netrunner? How many credits do you spend over the course of an average game installing things and breaking ICE? Logically, that’s how many you should include. In practice, it’s not that clean a math problem. It not only depends on how aggressive the deck is that you’d like to be playing, but also on the strategy your opponent is employing. There’s also the problem that some games go for twenty or more turns, and some last for less than five. The real guiding principle is that, when playing, it should feel like you have enough money to be able to keep up in tempo, and be able to make the runs you need to when you need to make them, and it needs to feel this way regardless of the deck type you’re playing against. As a statement, this might sound obvious to the point of ridiculousness. Of course you need to have enough money to play the game. Thanks, Saan, good article. Unless you’ve played the game a **lot**, though, knowing how much money that can be can be a real issue. There’s two sides to having enough money. One is to actually put the physical cards in your deck. The other is to not run so often and poorly that you run yourself dry constantly. Since this article focuses on the deckbuilding aspect of Netrunner, I’ll leave the other side to other authors. Personally, I recommend [“Where the Wild Agendas Are”](https://stimhack.com/where-the-wild-agendas-are/), by Stimhack author SimonMoon. Although it’s a little dated now as to the cards and archetypes it talks about, in terms of where to run and when, it’s a hell of a good read. As for my job, let’s start talking. As noted earlier, there are 3 different types of economy. Burst econ includes cards like Sure Gamble, or Peace in Our Time. They give you an influx of cash, and are then spent. Burst econ is good to include in runner decks because it can provide you with more money than the corp may have expected you to have on a given turn, or can allow you to cross an economic hump in order to quickly install something else in your hand and not be broke afterwords. Cards like Dirty Laundry and Career Fair are a kind of burst econ as well, but they also have the added benefit of letting you do something else that you wanted to do on the turn (make a run, or install a resource, respectively). Their payoff is low, but because of the added benefit of doing two things in one action, are still considered good and are played. However, since the payoff is low, they shouldn’t be leaned on heavily as a source of money. Easy Mark is a card that’s very similar to these two cards, but because it also doesn’t provide an additional action, is considered a weaker alternative and is rarely, if ever, played. Most decks will also include some sort of what I’ll refer to as temporary econ as well. These are cards like Daily Casts, Liberated Accounts, and Armitage Codebusting. Once they’ve paid out, they self-trash. Cards like Technical Writer are similar; once you trash them, you get the money, but the card is gone. These provide a bit longer-term econ than the burst of event econ. Most decks can function on a combination of both of these. The final type is sustained econ, and can include cards like Underworld Contact and Data Folding that pay out slowly for the rest of the game, or cards like Magnum Opus, that you can simply click for cash whenever. 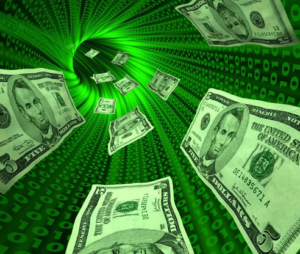 Within these types of economy are a subset of cards that people refer to as Run Economy. In the least surprising definition ever, Run econ cards are cards that give you money, but also require a successful run to have taken place before you actually receive said money. I’ve already mentioned Dirty Laundry, which is the intersect of Burst and Run economy. Cards like Bank Job are the intersect between Run and Temporary econ, because you put 8 credits on Bank Job and then only get the money when you run on a remote server, in this case *instead* of accessing. Finally, cards like Security Testing are the Sustained section of Run economy; cards that stick around, but still require a run in order to pay out. Because of the way that run economy works, it ends up paying the runner less and less money the more and more ICE the corp has rezzed, and therefor gets worse as the game goes on. However, some run economy cards still reward you with card accesses, and the power to both see cards and getting paid to do so shouldn’t be overlooked. When choosing what cards to include, it’s good to look at how much money you’re actually getting out of the cards you choose. Burst economy is simple. Sure Gamble costs 5 and gains you 9, so you just got 4 credits. Now let’s examine Data Folding. Data Folding gives out 1 credit a turn, clicklessly, so long as you have 2 free MU. However, at 3 to install, it takes 3 turns for it to even pay for itself, and another 4 turns to be worth that Sure Gamble that gave you 4 credits in a single click. At this point, Data Folding was effectively also a click (for the install) for 4 credits, but it also took 7 turns to get there, *and* has a condition that must be met before paying out. Armitage Codebusting starts with 12 credits on it, and costs 1 to install. Initially this might also look good, since 12 credits is a lot, and you only paid 1 to get it. In Netrunner, though, you can always spend a click to gain a credit. Because Armitage requires you to click it to gain those credits, each click effectively only gains you 1 credit over clicking for credits manually. In the end, it’s only really worth 5 credits over the course of 7 clicks — that is, each time you click it, you gain 1 credit over clicking for credits manually, and that takes 6 clicks total (12-6 = 6 credits over 6 clicks), and then there was the credit spent to install it (5 credits over 7 clicks). As you can probably guess, Armitage isn’t played very often, given both it’s payout and action intensive usage. Finally, you *could* also count the click you spent to install it as a click you could have also used to gain a credit, lowering Armitage’s total payout to 4 credits over 7 clicks, but usually I don’t count the installation click as a credit, because every installation takes a click, and I don’t see much use in adding a virtual +1 to the cost of every card in the game. 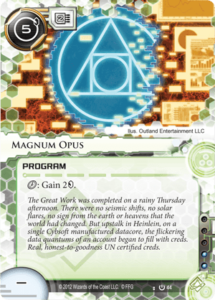 One of the best economy cards in the game right now is Magnum Opus, which might look strange, because the Opus works almost exactly the same as Armitage. Once installed for 5 credits, you can spend a click to gain 2 credits whenever you want. Decks that have Magnum Opus rarely play any other form of economy other than Sure Gamble (because, as noted, some burst economy is good). Why is this so different than Armitage? Well, for one, it never goes away. Once Armitage is gone, you have to spend time to try and find another copy, which then takes another click to install, etc. While doing this, you’re also trying to find and set up your programs and pressure the corp. Once you’re set up, you still need to try and find more money in your deck. With Opus, that single card gives you the money to set up, and then provides you money for the rest of the game. A common turn once you’re set up and waiting for the corp to pressure you somehow is to simply take 8 credits and pass your turn. Doing this every turn for a few turns will produce a gigantic pile of credits on your side of the table. Now if the corp tries to score an agenda, you almost certainly have enough money to go get it. And yes, it’s still only 1 credit better than clicking for credits, but the fact that you never have to worry about needing to draw or install any more economy cards makes up for it. It’s down side is that it’s slow taking 2 credits a click in the early game while trying to set up, because you need to split your clicks between clicking for money and clicking for cards to play or install with that money. Not every deck can play Magnum Opus, though, because it costs influence everywhere but Shaper, and it also takes a full two Memory. Also, it is very slow, and some decks can’t afford to sit there clicking Opus to make money because they need to use their clicks doing other things instead. Because of this, most decks will play a mix of other different economy cards. The number that is thrown around commonly is 12 economy cards, but a little more or less than that is fine depending on the deck. If you’re not sure if you have enough, add more. 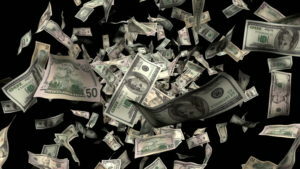 You can always take some out if it seems like you’re always drenched in cash when you play. Let’s say we’re building an Anarch deck. Easy inclusions would probably be Sure Gambles and Liberated Accounts. Another popular economy card is Daily Casts, so let’s throw in a play set of those too. If, during the deck building process, we decide we might like cards like Earthrise Hotel, and/or other resources that cost 3 or more, it could be prudent to spend influence on Career Fair, to lower the cost of those resources, effectively giving us a refund. So, assuming we now have 3 Sure Gambles, 3 Career Fairs, 3 Daily Casts, and 3 Liberated Accounts, we can see how much money we have in the deck. The only mathy one to figure out is the Liberated, so let’s get cracking. It costs 6 to install, and gets 16c on it. You click it for credits, and get 4 per click. Again, since we can get 1 credit per click anyhow, that’s effectively 4 less credits we net off clicking manually over those 4 clicks. So then, we’d get 16, lowered by 4, and lowered again by 6 (the install cost) for 16 – 4 – 6 = 6 credits net. All together then, we get 12 credits from Sure Gambles, 15 credits from Daily Casts (costs 3, pays 8), 18 credits from Lib Acc, and 9 credits from Career Fair for 12 + 15 + 18 + 9 = 54 credits total within the deck. As it is, I’d consider adding some more economy to this deck — maybe just a couple more cards. Remember, you have to set up your programs, hardware, use your events, and make runs through servers, all of which take chunks out of that 54 credits. And that’s assuming you draw your entire deck! Now, you can certainly click for credits manually on occasion, and that’s not only fine but encouraged. Nothing’s worse than seeing a player trying to draw for economy and throwing away tons of cards when what they really need to do is just draw once and click for credits 3 times. However, you want to be able to have enough economy to react to what the corp is doing, as well as threaten them with what you might do yourself, and it’s hard to do that if all you’re doing is clicking for creds because there’s not enough economy in your deck to bother drawing for. Next, I’m going to share a deck list with you that I’ve created so that you can see what I’m doing economically and how it fits into the rest of the deck. Don’t worry too much about whatever other cards I’m using, or how I’m spending my influence or why, but just try and get an impression of the things I need to install and how much money I’ve included to do both that as well as run on servers. This is a slightly modified version of the deck I played in the Slovakian Nationals, where I got 6th place overall. I believe the modified version to be better, which is why I’m using it as an example instead of the older version. First things first: just because Smoke is a 40 card ID does not mean she gets to take less money than other runners. Netrunner is still going to cost a certain amount of credits to play. However, Smoke decks use stealth breakers and credits (we’ll cover this in a future article about breakers and ICE), so she can often break into servers by spending less real credits (sometimes drastically so) than other runners. Seeing as this is the case, I have made the conscious choice to have less economy than might otherwise be appropriate. This isn’t to say that the deck can’t make quite a bit of money, though. The obvious money cards are the Sure Gambles, the Peace in our Times, and the 2 Daily Casts. Deuces *can* gain money, but isn’t really a money card, since if you use it for 3c, it really only nets 1c. Ghost Runner, Net Mercur and Cloak are kind of money, but (aside from sneaky uses of Net Mercur) aren’t really used for regular economy. The most potentially powerful econ card is Tapwrm. This deck, as does several others these days, uses the synergy between Peace in our Time and Tapwrm to both give yourself and the corp money with Peace, and then use the corp’s newly-bolstered credit pool to gain even more money through Tapwrm. Tapwrm can get purged off the table though, so the Sacrificial Constructs are the other key to keeping it in play. If the corp is rich enough, this can lead to a windfall of credits at the start of every turn. Finally, although it might not seem overtly obvious, the Smoke ID itself is an economy card that can give you one credit a turn, which is potentially quite powerful in and of itself. In this deck, most of the setup money comes from the burst econ of Peace in our Time and Sure Gambles, as well as the temporary econ of the Daily Casts. If you can draw a Sacrificial Construct early on, it can be worth installing Tapwrm early and use that sustained economy to set up as well, although it’s not usually worth installing unless the corp has 10 or more credits, and never worth installing (in this deck) unless you can protect it from getting purged. However, Tapwrm is usually used as more of the mid-to-late game economy, where it can reliably give money to be used for runs. In this same vein, the temporary econ of Ghost Runner and the sustained econ of Net Murcur, Cloak, and Smoke herself are all used for that mid-to-late game aggression to power cheap accesses. Because so much of this mid-to-late game econ is in sustained sources, I figured I could afford to dedicate fewer slots to economy, and have a weaker overall economy than other decks might. Another reason for this choice is that I can utilize the reoccurring stealth credits as well as the power tokens from Lady, all of which let me break into servers for drastically less real credits than other decks, meaning that the deck can sustain itself on that lower economy. However, because of this lower econ, being too aggressive too early can lead to a depletion of my real credits on hand, so this style deck prefers to sit back and power up in the early game in order to lock the corp down in the late game. Even so, I’ll still take the occasional click, especially early game, to take a credit or two. You rarely want to fall low on credits, or else you become in danger of not being able to play the cards you need to. Also, a deck like this can easily become too poor from making bad runs and burning credits needlessly. I’d honestly love to have a little more money in this deck, but Smoke’s 40 card ID makes that hard, and going above 40 cards goes against one of her advantages in a smaller, more consistent deck. This, then, is a deck that generally has just enough credits to function. Rarely (though sometimes) do I end a game on a giant pile of credits. This will be contrasted heavily by the corp deck we’ll examine later. The corp’s game plan is entirely different than the runner’s, so I’ll break it down by phases of the game. In the early game, you generally want to install ICE protecting your central servers to secure them against the runner poking around. In the mid-game you want to have a scoring remote and to be using it to score agendas, as well as usually trying to pressure the runners in other ways, usually though the use of assets of some kind, either protected or naked. In the late game the runner can probably get in anywhere, given enough money, so it’s your job to tax them during their runs and try and open windows where you can score your final few agendas to win. As I’m sure you’ve guessed, this can take an unbelievable amount of money. The specific things that a corp needs to spend their money on are rezzing ICE, installing ICE, scoring Agendas, and rezzing Assets and Upgrades. Paying for Operations is needed as well, but usually isn’t as large of a drain on your economy as the rest of these things. Just like the runner economy, the corp has the same 3 types. The corp player has burst economy in the form of operation economy, and is almost a complete analog to runner event economy. As an example, Hedge Fund is basically the same card as Sure Gamble, and just as good on corp side. Cards like Adonis Campaign serve as the temporary econ options, and things like Pad Campaign and Capital Investors are the sustained econ. Unlike the runner economy cards, your economy assets are much more easily trashed. As an example, Adonis Campaign gets 12 credits on it when rezzed, and you gain 3 of those credits at the start of your turn. It rezzes for 4, so you gain a total of 8 credits off it. However, it trashes for 3 credits. Let’s say you installed this Adonis unprotected, and you rez at the very end of the runner’s turn. You spend 4, and took 3 credits when your turn starts, so you’re currently down 1 credit. On the runner’s turn, they have the audacity to come and trash your Adonis Campaign! What was to be a gain of 8 credits has turned out to be a loss of 1. Sure, the runner also lost 3, but that’s a fine trade for them — they just kept you off 9 credits, and that means you’re going to have trouble rezzing ICE and scoring agendas. This also means that your sustained econ options aren’t nearly as stable as the runner’s are. Whereas Magnum Opus is considered a great card, the analogue on the corp side, Capital Investors, isn’t considered very good, even though it costs 3 less. This is because it threatens so much money that it will almost certainly get trashed very quickly by the runner, and has the very low trash cost of 2 credits. Often, it gets installed, rezzed for 2 and then clicked twice, netting 2 credits over 3 clicks, which is worse than clicking for credits. Then the runner goes and trashes it. Plus, it’s not like the runner’s side where you throw down Opus and you’re good for the game. Investors needs protection, but then if you want to score you either need to trash it, removing it’s economic gain for the rest of the game, or make a new server entirely, spreading your ICE too thin. It’s almost impossible for a corp to adequately defend R&D, HQ, and 2 separate remotes. As a corp, you need to judge when is a good time to ICE assets, and when it’s fine to just let them sit. As we found, Adonis is one you want to protect. The nice thing about Adonis, though, is that if you protect it, and even if all the money that Adonis paid out went into nothing but just protecting it, that means that you now have a server of rezzed ICE that you can score out of in the future, or use for further temporary econ assets. The point is that getting that 8 credits from Adonis is worth it, because that money will get used. At the end of the day, you probably want around 12 econ cards in your corp deck as well. These can really be almost any mix of Operation econ and Asset econ cards, but you should be able to reliably get and protect what money you need. If you find that the runner is trashing your asset economy too often, either try and protect it more, switch to more Operation based economy, or try and switch to more expensive-to-trash assets. For example, Melange Mining Corp can get you a lot of money very quickly, but also just trashes for a single credit. Sometimes this means that they get trashed out or R&D before you can even see it, so try and keep this in mind about your asset econ as well. One nice thing the Corp has going for it, though, is that clicking for the occasional credit fits almost naturally into it’s game plan. Let’s say I draw an ICE I want above R&D, and there’s another ICE already there. It’s going to cost me 1 credit to install that new ICE, but I’ve already decided I don’t want to draw more cards this turn, and don’t want to fall too low on credits and risk not being able to rez my ICE or score an agenda later, so I install said ICE and click for 2 credits for the rest of my turn. Now I’m 1 ahead of where I started. The corp is at a little bit of an advantage over the runner in that if we’re both set up — I have a good amount of ICE installed and rezzed over my servers, and the runner has their programs installed and can break all my ICE — but both only have 3-4 credits, I can still jam and score an agenda on that 3-4 credits, and the runner probably can’t get in the server to steal it on the same amount of money. This means that even late game, clicking for a few credits can be beneficial. We’ve taken a look at a runner deck, so let’s take a look at a corp deck too. Look at how much the ICE costs to rez and consider how much it might cost to install 2-3 on R&D, HQ, and a single remote. Also, pay attention to the Operations that require successful traces and what that means for the corp credit pool vs the runner’s credit pool, and in turn what *that* means for the corp’s economic needs. This is the other deck I made and played at the Slovakian Nationals, again with changes I’ve made afterwords for improvement. If it wasn’t obvious from your glance through the cards above, this thing requires piles and piles of credits to run, in stark contrast with the Smoke deck. The ICE tends to be fairly heavy to rez, and it needs to score at least two 5-cost agendas and one 3-cost operation (as it’s 7th point). I need to protect 3 out of its 7 agendas in The Future Perfect by paying money when they’re accessed. After all that, if the runner does steal an agenda, I need to be able to pay to use Punitive Counterstrike one to two times in order to win the game, meaning that I have to potentially have more than twice the runner’s money. This deck takes a truly gigantic amount of credits to function, and I still click for the occasional credit. Let’s dig into the economy. First off, the ID itself is an economic engine, which is the reason that I’m playing under this ID, rather than a different one. The runner draws a lot of cards over the course of a game, and this ID pays you the first time each turn that happens. Even facing off against a runner that’s trying to play around it somewhat, the ID will still end up giving you around 10 credits a game, with the potential of quite a bit more of they’re not. Beyond that, we have 9 cards in burst economy, including one of the best money-per-payout cards in Celebrity Gift. With this deck, showing them your hand is a fine exchange to net 7 credits. Never use this card for anything less than full value, especially since it costs 2 clicks to use. Finally, there’s two copies of Bryan Stinson. If the runner ever dips below 6 credits (which is easy to do against a deck that taxes this heavily), I can flip over Bryan and potentially make a fortune. If I have a two Hedge Funds and an IPO in Archives, it nets 29 credits after paying 2 to rez Bryan. The Preemptive Action is often used to recycle economy back into the deck as well, furthering the potential economic gain. Unlike the Smoke list, this is a deck where we want more money than one typically might. We want more money because we need to be able to both score our agendas, rez ICE, *and* be able to trace the runner successfully after having done both of those things that normal decks do. However, you can see that I’m running at less than the recommended 12 economy cards. This is largely because of the staggering economic impact that Bryan Stinson can have, as well as the large amount of credits that the ID itself can bring. If we’re willing to count the ID as an economy card, than I actually do sit right at 12 econ cards. The ability to help recycle used economy operations through Preemptive Action also can not be overlooked, as this can allow us to effectively have more than the stated goal of 12 cards. Unlike the Smoke deck, almost all of the money in this deck is burst economy. Obviously the 9 Operations are burst. The ID itself is technically temporary economy, because the runner’s deck can eventually run out, and then when they can’t draw any more, we don’t get paid anymore. Finally, Bryan Stinson is also burst economy. At first glance, by my given definitions, he might look like he belongs in the sustained economy category, since he sticks around on the board until the runner comes and trashes him. However, the way he functions is what really matters. The only way he works is if I have an Operation in Archives and the runner is below 6 credits, at which point he can then fire off the Operation again for a large burst of cash in a one-time lump; thus he gets filed under burst economy as well, albeit a strange burst econ card because he can be trashed, unlike most Operation econ. The reason I chose this style of economy for this deck is that the choice of assets that can make a large enough amount of money to sustain it simply don’t exist in the given assets that are available within available Jinteki cards. If I go outside of faction to HB or NBN than it begins to dent into the influence I need for the Weyland Alliance cards that I believe are needed for the deck’s consistency. I could take a chunk of influence out of Bryan Stinson and use that influence for cheaper Weyland cards and instead grab an Adonis Campaign or two, but then that begins to create card space issues, as well as potentially ties the scoring server up. Honestly, cards like Adonis Campaign, Launch Campaign, or Melange Mining Corp could all potentially work, and can make good money. In my testing, however, I found I rarely liked Assets tying up my scoring server for very long. I only need to score 2 agendas, as noted earlier, but the scoring windows for those can be very small sometimes, and I want to be able to jam an agenda down and feel comfortable that I’m not ruining my future economy by interrupting an asset that hasn’t paid out much money. Operation econ usually gets played the turn it gets drawn and boosts you up economically instantly (one might say in a burst of some sort), enabling the immediate rezzing of ICE or scoring potential. Being able to play Celebrity Gift and go from 3 to 10 credits suddenly threatens a rez of DNA tracker or a comfortable rez of perhaps a Komainu, and now the runner needs to keep this in mind while running. If this were an asset like PAD Campaign, the payout would be too slow to threaten things, and if it’s a card like Adonis Campaign, the runner can keep me low by trashing it. There’s little the runner can do to keep me from playing Operations. Bryan Stinson has further synergy with this style of econ in that he uses the economy cards I’ve already used to make even more money. Furthermore, he’s an Upgrade and can peacefully co-exist in a server with an agenda at the same time, or be thrown on a central server if it seems safer at the time. Aside from these decks, I encourage you to look at other decks that have done well in major tournaments and see what they have done for economy. Because of the new Ban and Restricted list, as well as rotation, I’m sure some of these decks might contain cards that are no longer of legal use, but it can help further give you a concept of what “enough” money can look like. A great example is the Worlds 2016 winning Runner deck Papa Smurf. Effectively, the deck is just a big pile of economy, card draw, and breakers, and it won everything. 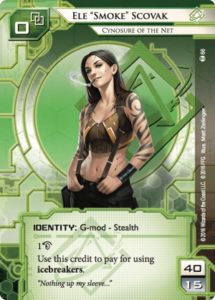 Thanks again for joining me on this examination of credit economy within Netrunner! Next time I’ll be discussing ICE and Breakers, where I’ll be talking about efficiency as well as different styles of decks. I’ll see you then.